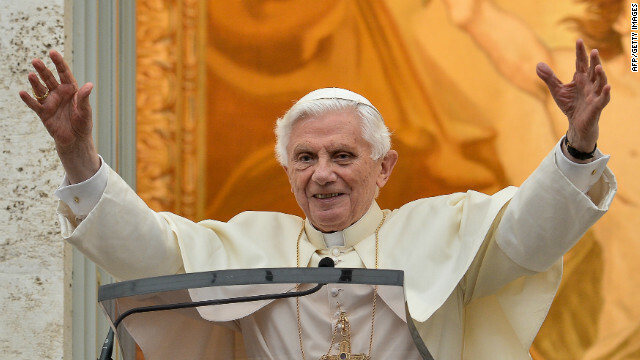 • Pope Benedict XVI to resign: "The spiritual leader of 1.2 billion Catholics, Pope Benedict XVI, surprised the world Monday by saying he will resign at the end of the month 'because of advanced age.'" • Northeast digs out of blizzard, cold moves South: "A major winter storm whipped the Upper Midwest early Monday, just after a historic snowfall left much of the Northeast buried and without power." • Search for ex-cop at center of LAPD revenge plot widens: "As the manhunt for the renegade ex-cop accused of killing three people in a revenge plot targeting the Los Angeles Police Department enters its second week, the big question facing authorities is: Where is Christopher Jordan Dorner?" • Millions of credit reports have errors: "Millions of Americans have mistakes on their credit reports, some of which are serious enough to lower credit scores and result in worse credit offers, according to a new government study." • Winners from the 2013 Grammys: "Thanks to their second studio album, 'Babel,' Mumford & Sons took home the Grammy for album of the year at the 55th annual Grammy Awards on Sunday, February 10, in Los Angeles. This is the band's second Grammy award." Young people who have irregular behavior are too often amped-up with anti-depressant prescription drugs which should be at the top of the problem list in our opinion. No one in the media or in Congress seems to talk about the problem. Why? Is it because too many are funded by the pharmaceutical industry? Because of their lack of knowledge people are too quick to blame guns. Piers Morgan: You say that you are a Catholic. In fact, you are a ROMAN Catholic. All followers of Jesus are "catholic" – meaning they belong to the universal church. Well, The frenzied media make a big deal about this much needed change of scenery in Rome – good leaders know when to quit. Bad leaders cling to power way too long, for narcissistic reasons. Such change of guard is essential for all groups in religion/politics for survival. The sky is not falling down yet! The Pope was thoughtful enough to step down and enjoy his old age in his own privacy. Leave him alone. Stop speculations.